Fact: There have never been this many great musicians in the world playing exceptional music. Another Fact: Far too few of the inspired acts are being heard (despite the best effort of blogs like this one) and the result is that listeners are turned into consumers - who are tended like cattle and raised to digest over-glorified "buzz bands" and manufactured music icons. Let's all agree that these dynamics need to come to an end. WORTHY OF NATIONAL ATTENTION - the spotlight shines brightly right now on an act of true merit - and a new record we at RSL are prepared to call one of the best new records of 2010. e of mbringing band and their own brand of what I am calling Americana Grind, or post-Americana. 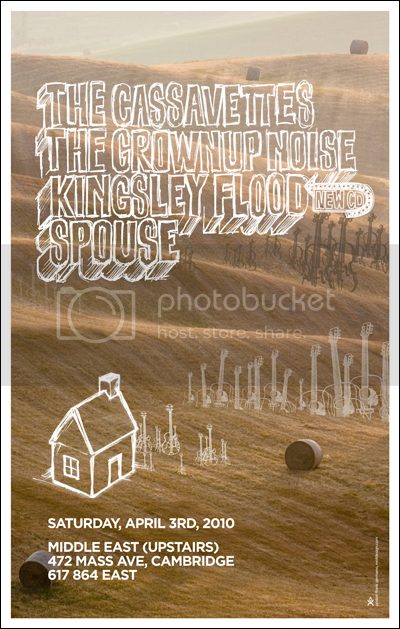 Kingsley Flood are a group of musicians I truly respect. It's a distinction I want to clearly make - and something that will become abundantly clear to you on a listen. immediately. 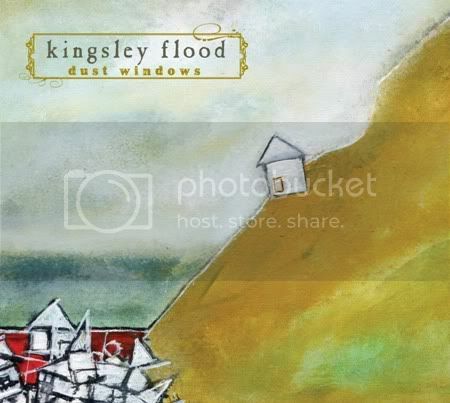 REACHING OUT - The elemental songs from Kingsley Flood's Dust Windows are a rich touchstone for their listeners. It's hard not to hear elements from some of greatest music heroes and some pretty amazing contemporary influences: Everything from the overtly classical Country, to Americana, Indie Folk, Blues, Rockabilly and Gypsy. In the music and through the prose here, I detect echoes of Hank Williams, Robert Johnson, Woody Guthrie, Paul Simon, Joe Strummer, The Low Anthem, Bon Iver, Morning Benders, Dr Dog, and Lucero. These comparisons aren't labels - this is pop music's lineage, past and present. TRACK TALK - We are welcomed into Dust Windows by "Back into Back." Here, cricket and fiddle deliver us, walking, to the farmhouse door before the hollow-body bass shoos us into the kitchen for eats and conversation. Suddenly, the scene is set for Act 1. We are ready to embark through a trip through memory and time. Not all the elements of the record change: there's a strong devotion to the core Americana, but vocals and tone are weapons wielded along with the writing. This is a play on words, truly. The hypothesis stated in the previous paragraph is tested and proved immediately with the arrival of track two: "Cul de Sac" - a lovely, soaring stringed number that I just love. It's a joyous listen. I cannot forget to mention the the driving percussion (torn here between) grounding and powering the number. "I Got My Finger on the Pulse of The Nation," repeats singer Naseem Khuri. He's right, he does. Then a subdued trumpet sounds as if beckoned and controlled by a snake charmer. This track is beautifully recorded, edited and engineered - really nice, all around. EARLY BEST OF 2010 PICK - Dust Windows is a really beautiful, fun record. All the tracks here a highly digestible 4:00 minutes in length. Now, by mindful, this is the album version. The band's live performances could vary based on the jam and the mindset. This again returns me to the technician aspect of this material. This record could well be the start of something good. You want to be a smarter listener? Begin listening to acts like this. Kingsley Flood is Elemental Music.